Director: Hong Sang-soo. Cast: Kwon Hae-hyo, Kim Min-hee, Kim Sae-byeok, Cho Yunhee, Joabang Ki. 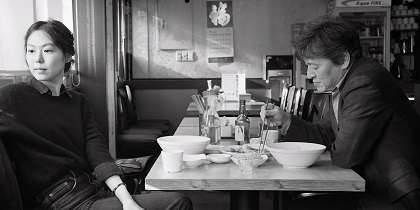 Screenplay: Hong Sang-soo. Twitter Capsule: Right then, wrong now. Most Hongs are similar and many are good but, Kim Min-hee aside, I got very little from this. VOR: ② Hong is sacred to his many fans and has carved out a niche imitable only by himself. But he overproduces, yielding skippable films like this one.